The MTA is not deterred by some lousy rain, and our annual event at the Whippany Railway Museum was attended by eight military vehicles and 15 club members. In the rainy early morning hours, we loaded Jeff Bennett’s and Pat Dolan’s WWII Jeeps onto a Pennsylvania Railroad flatcar for the short ride to the Museum. At noon, the first of four train rides took place, with many club members enjoying the hour-long excursion. The public was present with many kids. Some of the proceeds from this event will benefit the MTA. CLICK ABOVE FOR VIDEO! 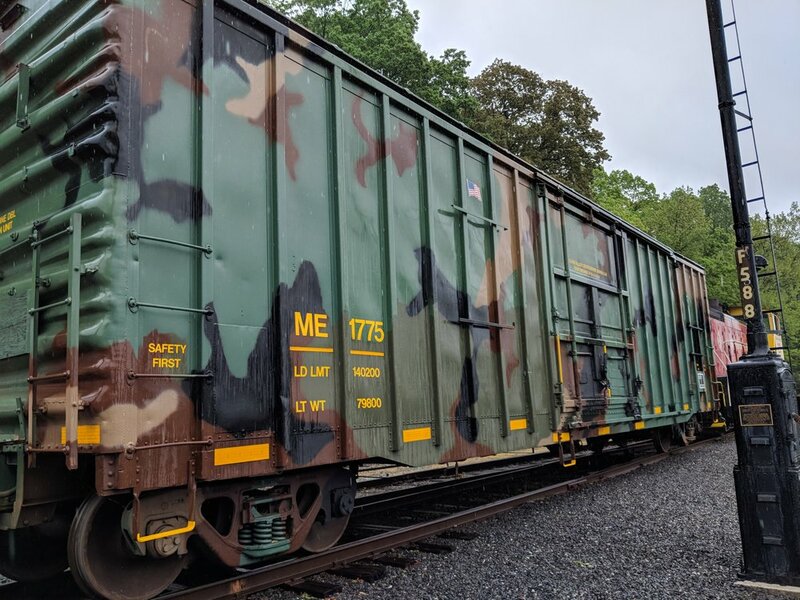 The Armed Forces Day train pulls into the Whippany Railway Museum with two WWII Jeeps on a historic Pennsylvania Railroad flatcar, along with Operation Toy Train's camouflaged boxcar!